"Who denied you entry? You tried to enter and were denied by virtue of an order or a law? ", asked Justice S. A. Bobde at the outset. The Supreme Court bench, also comprising Justice Abdul Nazeer, was hearing a Muslim couple's plea challenging the practice of prohibiting entry of women in mosques in India as being violative of Articles 14, 15, 21, 25 and 29 of the Constitution. Then the judge inquired about a similar case before the Bombay High Court in context of the Haji Ali Dargah and another before the Kerala High Court. "In Mumbai, they were permitted to enter the Mosque ('It's a Dargah, not a mosque', corrected Justice Bobde). The matter in Kerala was not dismissed on merits but because it was filed by a Hindu organisation and not a Muslim person. The High Court said let a Muslim person come forward...", replied the counsel for the petitioners. "What other mosques in the world allow women? In Mecca, they can? ", inquired Justice Bobde. "I don't think there is a common congregation"
The advocate advanced that in Canada too, women are allowed inside mosques and that in Saudi Arabia, there is a fatwah in that behalf. "Can the Fundamental Right to equality be assessed against another human being? Can you demand that a human-being treat you how he treats anybody else? Article 14 is for the State. Does that apply to an individual? Can you invoke 14 and demand equality of treatment by another individual? 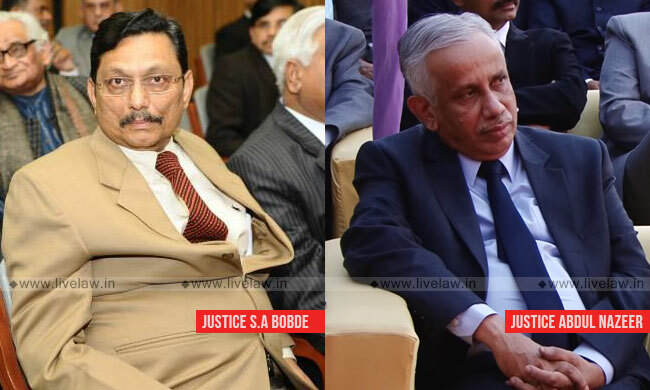 We can understand as for the State but not a non-state actor...", reflected Justice Bobde. "You are reading Article 14 that we haven't read"
The bench asked the lawyer to read out the provision in Article 14-"'The State shall not deny...'! ", pointed out Justice Bobde. "Is a mosque State? Is a temple State? Is a church State?" "That is not an offence! Why should the police help somebody? If you don't want a person to enter your house, can they get the police to help them enter your house?" "The Board (managing mosques) is acting as State instrumentality. Grants are given by the State...There are benefits from the State...", the advocate persisted. "What grants? What benefits? How is the state involved? The people in the mosque are individuals or not? We are not talking of the cement...", Justice Bobde refused to concede. However, the bench issued notice to the Central Government, the Waqf Board and All India Muslim Personal Law Board on account of the heavy reliance in the petition on the Sabarimala Temple Entry verdict (the decision on the review of which is yet to be pronounced)- "
"We are only hearing you, and may be will hear you in the future, because of Sabarimala Judgment. But you are not giving any satisfactory answer. We'll see...", remarked Justice Bobde, issuing notice.